Time goes fast. And small people grow big in that fast pace as well. Remember my news messages about the Maternity shoot with Jenneke and A new life came to earth? Well, that’s already a year ago. And that very little fellow from then is now already capable of walking around. And as of the day that I post this news message, he is exactly one year old and having his birthday party. Happy b-day Jens! 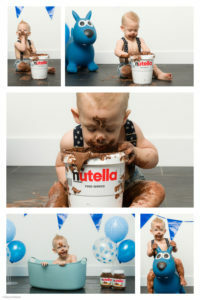 His brother Noël got a cake smash party when he got his first birthday. 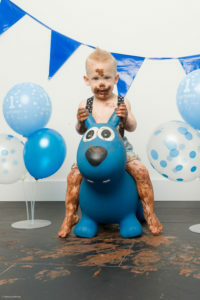 Check out my post about that here: Cake smash shoot with Noël. 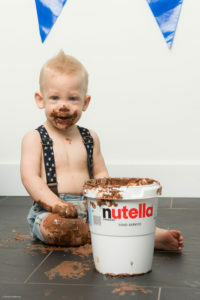 Now for Jens his mum and dad had something different in mind: a Nutella party. So Jens got his own big bucket of Nutella chocolate and hazelnut creme. And he loved it. 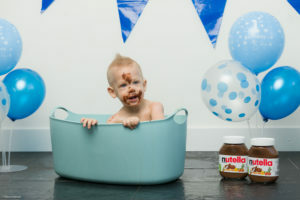 A salient detail is that Jens got more Nutella for this party than his own birthweight. Gladly he didn’t eat it all. 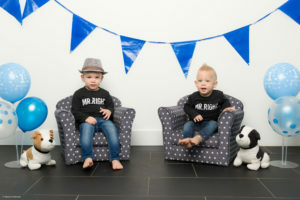 And before we started the Nutella shoot, we first did a shoot of the birthday boy with his big brother Noël. For this shoot I used only one studio strobe. With a big 150 cm octabox that gives a lovely diffuse light. So a big compliment to Jens for being such a relaxed and cooperative model. And a big thank you to his mum and dad for assisting me during the shoot. It was a fun shoot to do.